Journal Of A Petite Diva: IS THIS A CASE OF DOUBLE STANDARD? The Roman Catholic priest, Miguel Pajares, who got infected with Ebola while working in Liberia will be treated with an experimental drug that has been used on two Americans infected with the deadly virus, the government said. missionary was being treated in isolation, the health ministry said in a statement late on Saturday. Spain’s drug safety agency allowed the “exceptional importation” of ZMapp under a law that allows “the use of non-authorised medications in cases where a patent’s life is in danger and they can’t be treated satisfactorily with an authorised medication,” it said. Miguel Pajares was one of three people who tested positive for Ebola at the Saint Joseph Hospital in the Liberian capital Monrovia where he worked. He was brought back to Spain on Thursday on a medically equipped Spanish air force plane, the first patient in the fast-spreading Ebola outbreak to be evacuated to Europe for treatment. I am seriously wondering whether it is my dreams i heard and read that Obama said it is too early to give us the drug.I don't even want to think about it. It is our fault! If we had been more proactive the American-Liberian Medical Terrorist (that is what he is now been called) would not have put us in this condition. I am not happy right now. Thanks for stopping by. Miguel Pajares was one of three people who tested positive for Ebola at the Saint Joseph Hospital in the Liberian capital Monrovia where he worked. 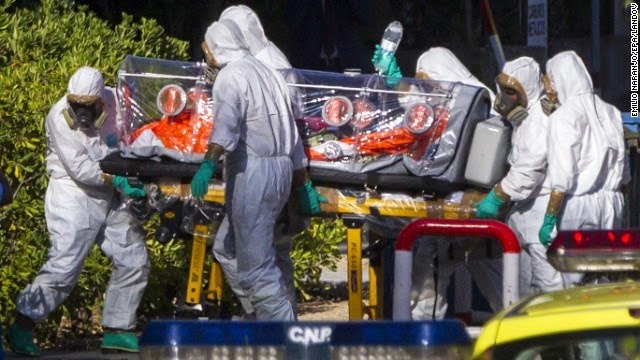 He was brought back to Spain on Thursday on a medically equipped Spanish airforce plane, the first patient in the fast-spreading Ebola outbreak to be evacuated to Europe for treatment. I feel worse. Honestly HIV is learning compared to Ebola. Hello you! I don't think I blame them. You have to deploy your resources carefully especially if they are scare resources. What favours do they owe us? We want to believe we are entitled to help but we brought this on ourselves. The epidemic was around us for many months and we did not establish any surveillance or mechanisms in place to protect ourselves. Our tendency to respond to things after the fact rather than be proactive is what brought us here, as is the case of BH. A great man I know said and I quote "The price of order is eternal vigilance". I hope that this epidemic will cause our ministries and government officials in all domains of life to be proactive and monitor their environment rather than stealing the country blue. SMH! You are right, Emmanuel. If we had been proactive all this wouldn't have happened. We like fire brigade attitude in this country. It is so annoying.